When you’re new to contracting, it can be hard to see the wood for the trees. Our role at Cinch is to help you enjoy all the benefits of contracting (more take-home pay, more flexibility) without all the faff (admin, figuring out tax). Let Cinch lead you out of the scary paperwork forest and into the light. It’s nice here. Our admin, accounting and payroll pros are here to ensure you enjoy all the benefits of contracting (more take-home pay, more flexibility) with none of the faff (admin, daunting letters, submitting your own tax returns). We get to know our customers and their work circumstances so well, they can pick up the phone, explain the problem and we see to it. Just like that. Have you decided whether you’re going to start a limited company or be employed under an umbrella company? This can be tricky. You may need to consider the lengths of your contracts, your finances and the amount of paperwork you’re comfortable with taking on. From this early stage, Cinch can help. Our specialist advisers will talk you through your options and allow you to make the most rewarding, least taxing choice for you. We’ve set out in brief some useful guidance here, but nothing beats a conversation face to face or on the phone. Call us. What is it? An umbrella company employs professional contractors who carry out short-term assignments for recruitment agencies and / or end-clients. What are the pros? 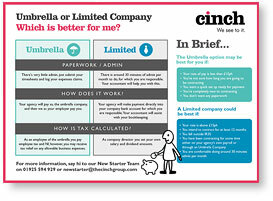 The umbrella company makes your Pay As You Earn (PAYE) and National Insurance (NI) deductions for you. It allows you to offset allowable expenses (such as travel, meals and accommodation) against tax – meaning you can increase your take-home pay. Cinch’s umbrella company service is the simplest solution for most contractors, with no unexpected tax bills and a straightforward process for claiming expenses (simply complete and submit your timesheets). You have the flexibility of contracting with the security of being employed, so you still have access to a state pension, statutory sick pay, holiday pay and maternity / paternity pay. What are the cons? This is the most expensive way of working. You will receive a salary that is subject to full PAYE tax and NI, so it’s just like being a permanent member of staff again. How can Cinch help? Let Cinch employ you under an umbrella company and you’ll have the full support of our human resources team. As well as helping to maximise your take-home pay we provide an SMS update service for payments and receipts of expenses, so you always know where you are with your money. * You want to do very little paperwork. 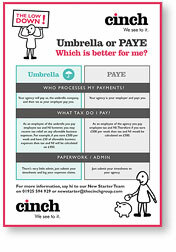 Umbrella or PAYE – Which is better for me? What is it? A limited company is an organisation you can set up and use to run your business. When you start a limited company, you become a director of it. What are the pros? This is a tax-efficient way to work as a contractor. As shareholder and director, you can draw on some of your funds as a dividend rather than being paid a full salary, so your overall tax burden is reduced (allowing you to maximise your earnings). You exercise more control over your finances too. Your enhanced accountability means agencies may feel more secure working with you than with freelance contractors. What are the cons? There is usually, of course, a downside to anything that sounds this sweet. Keeping track of your accounts and tax returns – and staying on the right side of IR35 – can be daunting. How can Cinch help? Our limited company services let you incorporate and run your business without you having to worry about much paperwork. Our dedicated accounts team will complete your statutory returns for HMRC and Companies House, check your numbers, and explain everything in a simple, jargon-free way. * You are comfortable with doing around 30 minutes’ work. The most tax-efficient way of working. Very easy to use, you simply enter your timesheet and expense details and wait to be paid. Claim a wider range of expenses. All tax and NI is deducted before you receive your money, so you will have no further taxes to pay. Access to the Flat Rate VAT scheme. Ideal for short-term contracts. You keep complete control of your financial affairs meaning you do not have to risk your money with any third party administrator. Ideal for contracts less than £25k per year. Running your own business isn’t difficult; submit spreadsheets to your accountant – just like umbrella time-sheets and expenses. Good if you are unsure if contracting is for you and you’re really just in between permanent jobs. Greater opportunity for tax planning than umbrella. Someone else will be doing all the paperwork. There is a certain amount of paperwork involved, usually about 10 – 15 minutes per month. The most expensive way of working. You will receive a salary that is subject to full PAYE Tax and NI, it’s just like being a permanent member of staff again. Can be costly if you contract for a very short period of time, then go back to permanent employment. You are reliant on the umbrella company to collect your money from the client or agent and then to pay it on to you. Not ideal for contracts less than £25k per year. Umbrella or Limited Company – Which is better for me?